East-West Brothers Garage: Editorial: You Know That Magical Stalk to the Left of Your Steering Wheel? Take this case for example: California Court: Signal Unnecessary When Nobody is Looking. According to a ruling passed about two years ago, a La Habra, CA police officer was apparently wrong for stopping a driver from making a right turn when no one was around. The officer charged the driver with violating Vehicle Code 22107, which essentially states that a signal must be used when another vehicle may be affected by your movement. Prosecution, however, argued that the driver actually violated Vehicle Code 22108, which states that a turn signal must be used continuously for the last 100 feet before a vehicle makes its turn. Prosecution states that because the officer was approaching the driver from the opposite direction while the driver was making a right turn away from the officer, VC 22107 was not violated. In short, the court agreed with the prosecution in that the driver did not violate VC 22107 because no one was going to be affected by his turn. You can read the about the rest of the decision here. Frankly, I thought the ruling was ridiculous as it sets the precedent for future cases of "but no one was around me, officer." How do you know whether or not there is not another driver approaching you from your blind spot? What about pedestrians? While I understand that a lot of our vehicle codes are somewhat vague and are open to interpretation, the use of turn signals should be common sense. Like I said earlier, we are not psychics. We do not know what another driver is thinking at a given time. How are we supposed to know that you plan on changing lanes or making a turn without signaling ahead of time? 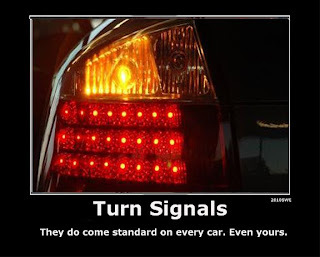 Is it really so hard to use your turn signals? Oh, and to those that own one of those above picture: you have even less of an excuse to not use your turn signals. They are mounted right in front of you and clearly indicated!